Stayed three nights, $25 a night. 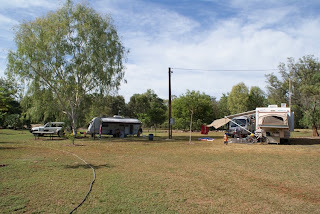 There are a few places to stay in Mataranka even though it is not that big a town. We were pretty happy with the park we chose and would certainly stay there again. Location- 7/10. Right near the Bitter Springs and on the Little Roper river (good creek). Sites- 7/10. No set sites, just drive around and find a nice spot. I like that, but Tim likes to have a designated area?? No idea why. But nice garden areas and a decent amount of shade. Heaps of room. Bathrooms- 4/10. More of those tin sheds with the shower, toilet and basin. But these ones were quite nice and certainly felt cleaner than the ones at Daly Waters. They are set up in a nice undercover area. Laundry- 4/10. Couple of machines in the undercover area near the toilets. Did the job though! $3 a load. Shop- 5/10. You can buy bread and milk from reception, and they also sell frozen mango and handy stuff like lures (in case you are like Dad and choose to throw a few at the fish) and you can hire goggles for the springs. They had a drinks machine too. Pool- None. A pool would have been nice but you've got the springs and the river so you don't really need one. BBQ area- 6/10. They had a camp kitchen area but i did not pay enough attention to what it had. But it was a good sized area so probably had all the usual bits. Playground- I did not realise until doing this that there was no playground. Normally it's one of the first things Jordy scopes out. But we had all those great sprinklers to play in and taps he was allowed to turn on and off so who needs a playground!??! Other- you can borrow pool noodles for the springs.